Ödön Pártos (also Oedoen Partos) was born in Budapest on 1 Oct 1907 and died in Tel-Aviv, 6 July 1977. He was an Israeli composer, string player and teacher of Hungarian origin. Born to an assimilated Jewish upper middle class family, he was a child prodigy and studied the violin with Ormandy. Hubay heard him play the violin at the age of eight and took him as a pupil at the Budapest Academy of Music, where he also studied composition with Kodály. After graduating from the academy in 1924, he was leader of the Lucerne Stadtsorchester (1924–6) and the Budapest Konzertorchester (1926–7). In 1927 he moved to Germany, working as a soloist, and in 1933 he became first violinist of the Jewish Cultural Centre. At the end of that year he returned to Hungary, moving then to Baku to teach the violin and composition at the conservatory (1935) and returning to Budapest as leader of the Konzertorchester (1937). During these years as a soloist in Europe he was very active in contemporary music and gave the premières of several works written for him, including Kadosa’s Violin Concerto and Suite for violin and piano. In 1938 he was invited by Huberman to become first violist with the Palestine SO (later the Israel PO), after which he lived in Tel-Aviv. 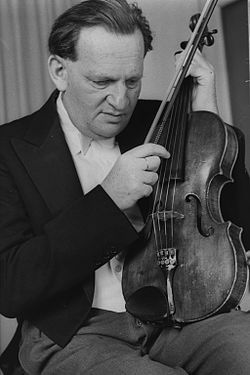 He stayed with the orchestra until 1956, also playing the viola in the Israel Quartet (1939–54) and appearing as a soloist in Israel and abroad. In 1951 he was appointed director of the Israel Academy of Music (later the Rubin Academy of Tel-Aviv University), and in 1961 he was made a professor. He travelled extensively as an adjudicator, lecturer and teacher, and received many honours, most notably the first award of the Israel State Prize (1954). Partos arrived in Palestine steeped in contemporary European traditions, particularly those of Bartók and Kodály. From them he had come to see folk music as a source of inspiration and to develop his personal style by enlarging Western tonality through a mixture of modal, oriental and chromatic elements; the best example of his work under their influence is the Concertino for strings (1932). By building on these principles, Partos was able to acclimatize himself musically and, in a conscious effort to seek out his Jewish ancestry, he took a particular interest in the musics of the various Eastern Jewish communities. He soon began to make arrangements of their folksongs, first for the Palestinian singer Bracha Zefira (Four Folk Songs, 1939), then for unaccompanied chorus (Six Songs, 1941). The experience had a strong effect on his later instrumental works, including the Four Israeli Tunes for string instrument and piano (1948), Hezionot (‘Visions’) for flute, piano and strings (1957) and Maqamat for flute and string quartet (1959). He also used some folk elements of the Ashkenazi communities of eastern Europe, notably in Yizkor (‘In memoriam’) for strings (1947), a work written in response to the Holocaust. In all these works, he brought a Western technique to bear on Eastern material, whether whole tunes, fragmentary gestures or melismatic patterns. In 1960 there came a change with Partos‘s turning towards 12-note technique; this is best exemplified in Tehillim (‘Psalms’) for string quartet or chamber orchestra and Dmuyot (‘Images’) for orchestra, both of which date from that year. It is important to stress, however, that his use of 12-note principles was never strict: fragments of three to six notes from the series were often cast as motifs or melodic cells and certain notes were also duplicated at the octave, thus implying a tonal hierarchy. Moreover, Partos always retained some connection with the music of his adopted environment, going as far as to affirm a connection between dissonant, serially-derived harmony and the clashes that result from heterophony. He found expressive force in the combination of serialism with an Eastern melos or biblical cantillation; the influence of maqām is still present, for example, in Psalms.